GEORGES BRAQUE (Argenteuil-sur-Seine (France) 1882 – París 1963). French painter, engraver and sculptor, who with Juan Gris and Pablo Picasso was one of the forerunners of Cubism. 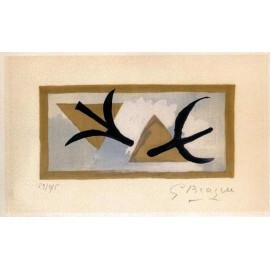 In close collaboration with Picasso, Braque developed a new technique later known as Cubism. Both artists began to experiment with collage. This productive artistic union was broken when Braque enlisted in the french army at the beginning of I World War. From 1917 he restarted to work by himself, and at the end of the war he developed a more personal style. BRAQUE Georges There are 4 products. BRAQUE Georges. Quatre oiseaux. 1959. 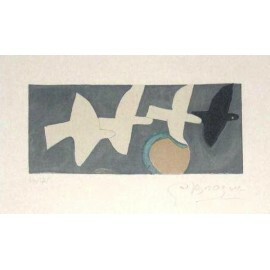 Graphic work Artist: Georges Braque Title: Quatre oiseaux Year: 1959 Media: Lithograph Size: paper 32,5 x 48,3 cm., plate 17,3 x 28,5 cm. BRAQUE Georges. Les martinets. 1959. 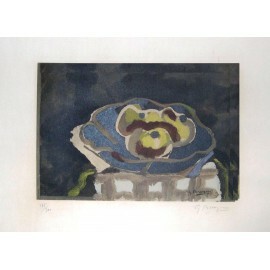 Graphic work Artist: Georges Braque Title: Nature morte au compotier Year: 1955 Media: Lithograph Size: paper 49 x 64 cm., plate 23 x25 cm. 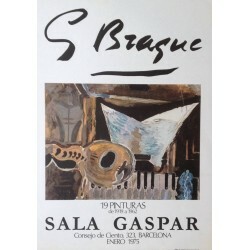 Original historical poster Artist: Georges Braque Title: "19 pictures from 1919 to 1962"(for the exhibition of Georges Braque at Sala Gaspar on January 1975) Year: 1975 Size: 69x49,5 cm. Printing method: offset Attention! The colour that you see at you screen may vary from the original poster. Tiny foxing spots may be present.